“It’s All In The Cloud” ~ Don’t get too excited, this has nothing to do with Cameron Diaz and Jason Segel’s comedy about storing a “sensitive” video in the cloud. This post is about the things that we will need to do this week to keep our feet on the ground when it feels like our head is in the clouds. Every week in our household is like a whirlwind. We are at a pool with one or both children every night/day except Sunday and like many people experience, work demands piles of time outside of the actual work day. We have had to find ways to communicate, and get everyone where they need to be (and fed) when only passing each other at the door in the morning and for maybe and hour (of exhaustion) in the evening after kids are in bed. Heading into what feels like the craziest week of them all, we still have to remember ourselves and remain hopeful to get in our weekly runs. In addition to our regular hectic schedule, we are throwing into the mix a high school 50th Anniversary and I am going away for two days and overnight with my Grade 8’s on their Grad Trip. Here are three of the things that will save our skins this week. Excuse the typos in the screen shot. The conversation was just TOO great not to post. Every morning the kids are getting on the bus for school before 7:30 and Petja is leaving for work at the same time. After Petja has fed them breakfast and made their lunch, they get dressed and I help them with hair and teeth and take them to the bus stop. Sometimes the first moment that we see each other in the day is at the door on our way out. Once I get back home from the bus stop Petja and I call each other to talk about how the rest of the day is going to run smoothly and… well… to say hello. We hash out the taxiing of the kids, dinner and running plans, review the family calendar and generally get our stuff together. That is the most important 10 minutes of the day. Plus, we get to talk to each other, uninterrupted for the entire time!!!!! Sometimes, we just can’t do it alone. Even though we pride ourselves on being able to get it all (ok, most) done, there are occasions when work pulls one of us away and there is NO POSSIBLE way to get everyone where they need to be. In those instances we rely on Petja’s parents who live near by. They gladly drive the “lifeboat” when we need them to. 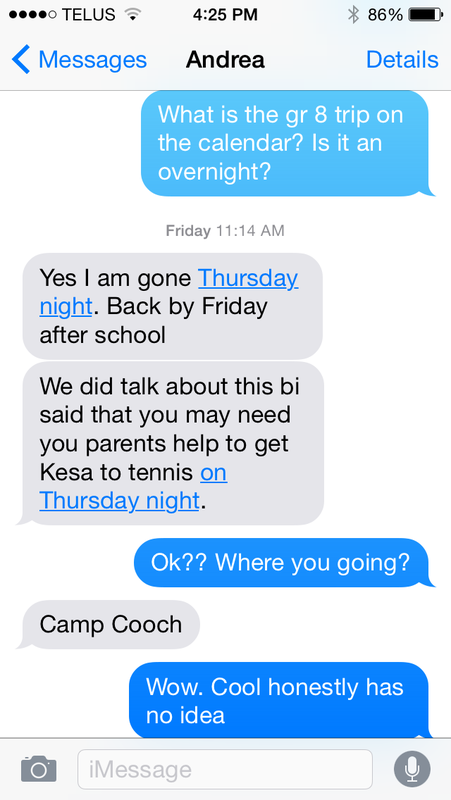 This week it will be Kesa’s tennis lesson that she would have to miss without their help. Other times, it is mid-day school assemblies that one or both kids are part of. With our jobs, we can never be there to see the award earned or the dance presented. Opa and Oma are always the best audience support for the kids and never miss texting us a photo.